Surely any Christmas without at least one visit to Charles Dickens’ A Christmas Carol, could not really be called Christmas. 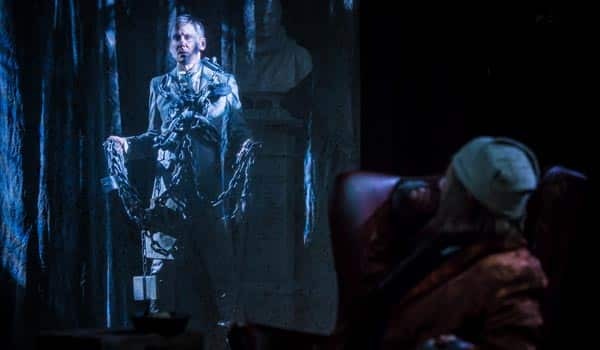 Such is the extent to which Dicken’s Christmas ghost story has been woven into our culture, that it has seen several production staged across London this year alone and has been adapted for film several times including the beloved Muppet Christmas Carol. 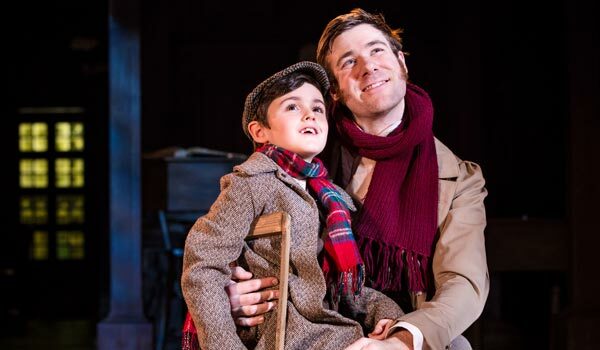 Antic Disposition founders John Risebero and Ben Horslen have combined with Musical Director Christopher Peake, to create a new version of A Christmas Carol with a slick script and familiar carols with new lyrics that really packs a punch. David Burt takes on the formidable role of Ebenezer Scrooge, full of humbug and bluster, he perfectly inhabits the Lord of humbug and misery, oblivious to the happiness of others over the festive period he is a man whose past has lead him to be miserable in the present. His transition following the visit of three ghostly spectres is revelatory. You can literally see the shadow of misery lift as he visits occasions past, present and future early on Christmas morning. Scrooge’s overnight journey is perhaps no more powerful that when we are shown the future of Tiny Tim if Scrooge fails to amend his ways. Leo Mann’s Tiny Tim is a delight and Bob’s sorrow at his passing palpable. The tight musical ensemble under the direction of Christopher Peake was able to create a suitably eerie soundscape and gave the acting ensemble backing for some wonderful choral singing throughout that really gave the piece atmosphere aplenty. I have to admit that the uncredited Ghost Of Christmas yet to come gave me chills as it glided across the floor leading Scrooge to a gravestone that would untimately prove to be his own. I would dare anyone not to be moved by this wonderful Christmas offering. It certainly gave this reviewer goosebumps and comes highly recommended. Listening to the news today and hearing about current states of homelessness in London at Christmas, it is good to be reminded that compassion and charity are important to society no matter what the year. This production really is a must see this Christmas.